Well Hello and welcome back! This is my first post of 2014. I'm a week late but that is ok. I had a nasty virus over Christmas break so I took to the time to lounge in bed and just get better. Now that I am feeling better I am really ready to kick this year off with lots of crafting. I am starting today with a new card and new (and new to me) products. I just got my hands on the new Hero Arts Pastel Daubers and I have to tell you THEY ARE AMAZING!!!! They go on like a watered down paint, they are very opaque and they feel so smooth like chalk when they are dry. I am in Heaven. Now I want them in every color...I hope they make more with this formula. You can see that nice soft finish to the daubers. Love it. 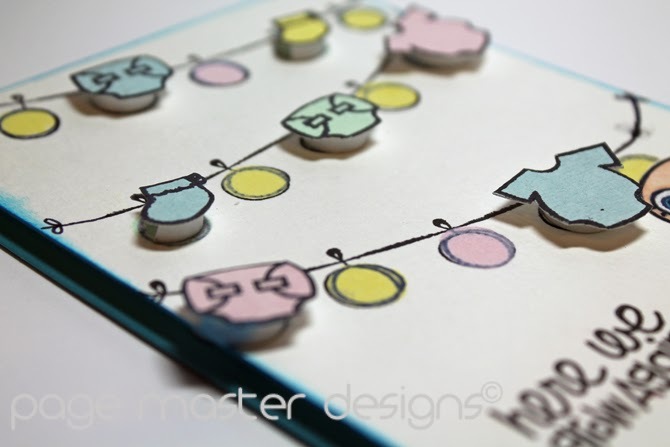 I decided to enter this card into the first challenge of the year on the Simon Says Stamp Wednesday Challenge blog where it's all about NEW and also over at the Sparks challenge blog where it's "Anything Goes". I hope you are all off to a wonderful New Year. This is so cute & those pastel daubers look amazing! Can't wait to get them! Thanks so much for playing at Paper Smooches Sparks challenge this week!